The Grande Armee - 200,000 strong - was assembled in camps all along the channel coast in preparation for the great invasion against Britain. But the French navy could not lure away the British fleet. Unable to secure temporary control of the English channel to ensure his army's safe crossing, and facing the newly concluded Third Coalition of Britain, Austria and Russia (concluded in April 1805), Napoleon was forced to abandon his plans to invade Britain. On 25 August 1805, the Grand Armee of 7 Corps, was ordered to march south towards the Danube and then east on Vienna. Ulm and "The Unfortunate General Mack"
On 10 September, Mack invaded Bavaria and occupied Ulm with his 85,000 men. He then waited for his Russian reinforcements to come up. The Grande Armee's dazzling march was totally unexpected. It was only on 30 September that Mack realised he was in danger of being encircled. A series of clashes were fought - at Wertingen, along the River Iller, at Hasslach and at Elchingen. By 15 October, Mack was almost completely surrounded. Hoping to win time for 50,000 Austro-Russian reinforcements under Kutusov to arrive, Mack opened negotiations with the French. When it became clear that the Russians were still far away, Mack finally surrendered his army of 30,000 on 20 October. This great victory was achieved, not through a major battle, but through a legendary manoeuver - the inspiration for the blitzkrieg. The next stage of the campaign was basically a pursuit by the French of Kutusov's force. Kutusov managed to skilfully escape the clutches of the French until he linked up with Buxhowden's 30,000 Russians on 20 November - near Olmutz. On 23 November, Napoleon - now with only 53,000 troops under his direct command - called a halt at Bruenn (present day Brno). 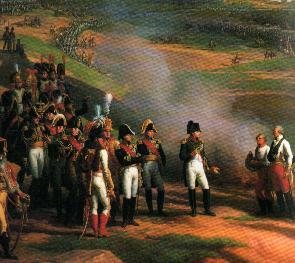 By Austerlitz, Napoleon - reinforced with Bernadotte's and Davout's corps - managed to field an army of around 73,000 men. The Battle of Austerlitz, 2 December 1805, was one of Napoleon's masterpieces. Though outnumbered, Napoleon managed to rout the Austro-Russian army - thereby causing the destruction of the Third Coalition. Through a series of deceptions, Napoleon tricked the Allies into thinking that his army was weak and could easily be swept aside. The Allies fell for his trick and were lured to turn the French right flank. The allied attack began at dawn - although the battlefield was shrouded in mist. When Napoleon judged that the Allies were fully committed on his flanks, he gave Soult the order for the Allied centre (located on the Pratzen Heights) to be stormed. The time was 9am - and the legendary "Sun of Austerlitz" revealed itself through the mist. By 11am, the French controlled the Pratzen Heights. Meanwhile, a fierce cavalry battle was taking place on the French left flank (Lannes) - with the Allies getting the worst of the exchange. When Lannes judged that the time was ripe, he ordered forward his infantry - which advanced admirably despite terrible losses. By midday, the Allies were giving way. Back on the Pratzen, desperate Allied counterattacks made no headway. Finally, the Russian Imperial Guard Corps under Grand Duke Constantine was thrown into the fray - the last roll of the dice. The Russian Imperial Guard - totalling 3000 Grenadiers and 15 squadrons of Guard Cavalry - assaulted the Pratzen, routing the 4th Ligne and 24th Legere Regiments. The gap in the French line was filled by the French Imperial Guard chasseurs-a-cheval and the grenadiers-a-cheval. 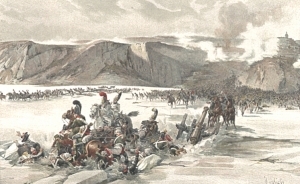 A fierce melee took place between the French and Russian guard cavalry. Napoleon ordered the Mamelukes and 2 more squadrons of chasseurs-a-cheval into the fray. Suddenly, the Russians retired - the French had the upper hand, by a razor thin margin. With control of the centre, Napoleon ordered his troops to wheel right in order to destroy the over-extended Allied left wing. This was the beginning of the end for the Allies. Their troops began to give way - soon they were in full retreat. The only escape route for the Allies was southwards, and many fled across the frozen Lake Satschan. "Soldiers, I am pleased with you! You have, on this day of Austerlitz, justified all that I had expected from your courage, and you have honoured your eagles with immortal glory. In less than 4 hours, an army of 100,000 men, commanded by the Emperors of Russia and Austria, has been cut down or scattered. Such enemy as escaped your bayonets have drowned in the lakes. Soldiers, when everything necessary for the happiness and prosperity of the motherland has been accomplished, I will lead you back to France: there you will be the object of my tenderest solicitude. My people will greet you with joy, and it will suffice for you to say, 'I was at the battle of Austerlitz', for them to reply: 'there is one of the brave.'" "Tell your master (Napoleon) that I am going away. Tell him that he has performed miracles...that the battle has increased my admiration for him; that he is a man predestined by heaven; that it will require a hundred years for my army to equal his."